The winter has been tough on me including some major disappointments. Therefore I needed some new inspiration and time to find myself. 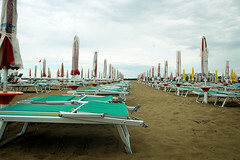 The past weeks I spent in Caorle a beach resort in north Italy. This time of the year it is quite empty, but this is just what I needed. I found inspiration to return to a photo series I have been working on earlier in Russia and Ukraine. The photo series is called “Faceless”. So the past weeks have been very good and I am fresh to return to creative work again. The bits of the puzzle are falling on their places again, because I have now a 3 month opportunity to work in an artist in residency in Austria. My plan is to finish the “Faceless” series, to exhibit it, and I have already received interest for the artwork from various art buyers. Looks like spring is full of sun! I am a photographer and artist. Nice to see you here! This entry was posted in Travel and tagged Carole, Faceless, Italy. Bookmark the permalink. I am a photographer and an artist. This blog is for friends and others to follow my work in progress. It is also my way of sharing experiences and insights of art related events I am taking part of. I hope you find something interesting. My ongoing Photoseries "Falsche Hoffnungen"